What Day Of The Week Was January 5? 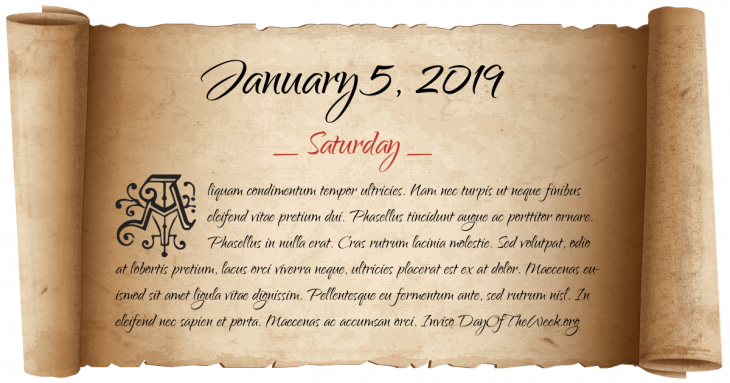 January 5, 2019 was the 5th day of the year 2019 in the Gregorian calendar. There were 360 days remaining until the end of the year. The day of the week was Saturday. Battle of Colmar: the French army beats Brandenburg. George Washington marries Martha Dandridge Custis. Dreyfus affair: French army officer Alfred Dreyfus is stripped of his rank and sentenced to life imprisonment on Devil’s Island. FM radio is demonstrated to the Federal Communications Commission for the first time. The Soviet Union recognizes the new pro-Soviet government of Poland. Hamas bombmaker Yahya Ayyash is killed by an Israeli-planted booby-trapped cell phone. Who were born on January 5?